SCORE...Counselors to America's Small Business...Ready for Referrals and Volunteers! 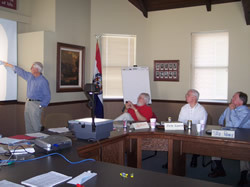 The Jefferson City SCORE chapter meets the 3rd Wednesday of every month, 10:00 a.m., at the Jefferson City Area Chamber of Commerce. Meetings will last 1-1.5 hours. The Chapter is ready for referrals! Whether you are thinking about starting a business, just starting a business or existing businesses in need of assistance, SCORE is here to help. Call Shaun Sappenfield at the Chamber Office, (573) 638-3586 or shaunsappenfield@jcchamber.org to schedule a FREE and CONFIDENTIAL counseling session. Volunteers to counsel clients can always join the group. Volunteers aren't necessarily retired...we have several active business volunteers! If you want to assist and offer your expertise in finance, marketing, human resources, manufacturing or other areas, we need you! Contact Shaun Sappenfield at the Chamber, shaunsappenfield@jcchamber.org or (573) 638-3586 to get involved!